I know I am in the extreme minority with this one (apparently), but I found it really hard to get excited about this one while watching it, and after. In fact, I have no real excitement to write this review, either. I watched this weeks ago and haven’t even been able to muster the oomph to write about it. I really don’t want to write a half-assed review, so let’s see how it goes. I totally don’t mind a dialogue based movie at all. I really don’t, if I feel that the dialogue is worth following. For me, that wasn’t the case here. It came off as pretentious and meh, like it was trying too hard. Truly. For two, I do like Ethan Hawke, a lot, I think he gets a lot of flak and he really isn’t the terrible actor that people say he is. I just thought that there was like no chemistry between him and Delpy. The runtime, too, felt like the movie was forever and two days long and it was actually (technically) a really short movie. Okay, you know what, I am just going to leave it there. I didn’t like this, and I really wanted to. There was this romantic angle that could have been more than it was. Not because I wanted some Disney-style something, but because I really thought that this could have been more genuine. For some it probably is, for me it fell flat. I know there are two more movies in this trilogy that is so well loved, but I don’t know if I will be taking the time to check them out. This entry was posted in Movies and tagged blind spot, boring, Ethan Hawke, Julie Delpy, movie reviews, movies, Richard Linklater, romance. Bookmark the permalink. Wow, we usually agree but when we don’t haha. It’s like we saw two different movies. HAHA! Usually we are in the same boat, but not this time! I haven’t watched this in YEARS but I remember really liking it. Ouch. I really liked Sunrise but enjoyed Sunset even more. For you though, if you didn’t care for this one I can’t imagine the others doing much for you. That’s what I am thinking. I just don’t know if I am willing to sit through another two of these. Oh well. Super surprised here. I didn’t absolutely LOVE this movie, but I liked it. 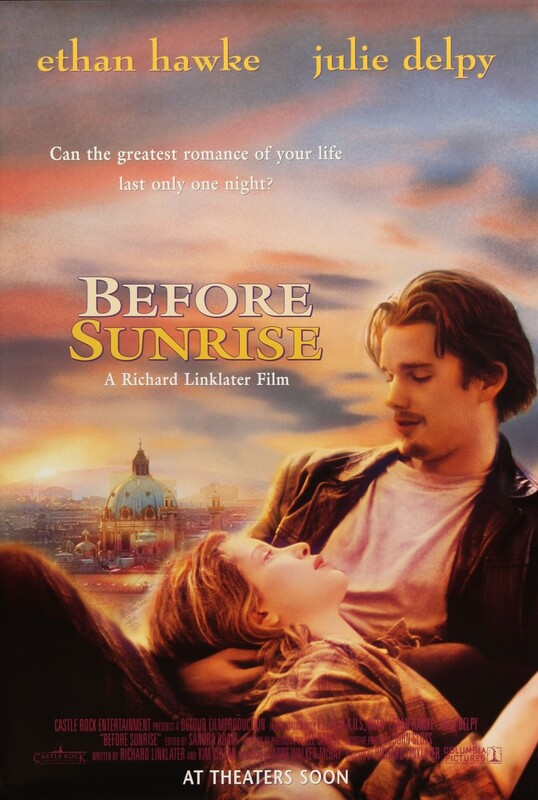 I’ve had a couple Before Sunrise experiences, so I appreciate this film. I find it better than the other two, so maybe just skip those lol! Haha, one of my more surprising reviews, it seems. That’s pretty cool though. Yep, I think I will be skipping the others.